Excellent service with a great professional team, I recommend them! Don't waste your time!!! Very poor costumer service! Lazy dirty ghetto employees! Trashy store! The people that work there are very rude ! I've never been treated so disrespectful ! 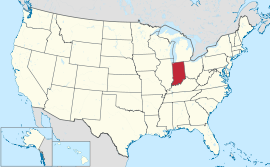 Indiana is a U.S. state located in the midwestern and Great Lakes regions of North America. Indiana is the 38th largest by areaand the 16th most populous of the 50 United States. Its capital and largest city is Indianapolis. Indiana was admitted to the United States as the 19th U.S. state on December 11, 1816. Indiana has a diverse economy with a gross state product of $298 billion in 2012. Indiana has several metropolitan areas with populations greater than 100,000 and a number of smaller industrial cities and towns. Indiana is home to several major sports teams and athletic events including the NFL's Indianapolis Colts, the NBA's Indiana Pacers, the WNBA's Indiana Fever, and the Indianapolis 500 and Brickyard 400motorsports races. The Wabash River, which is the longest free-flowing river east of the Mississippi River, is the official river of Indiana. At 475 mile (764 km) in length, the river bisects the state from northeast to southwest before flowing south, mostly along the Indiana-Illinois border. The river has been the subject of several songs, such as On the Banks of the Wabash, The Wabash Cannonball and Back Home Again, In Indiana. There are about 900 lakes listed by the Indiana Department of Natural Resources. To the northwest, Indiana borders Lake Michigan, where thePort of Indiana operates the state's largest shipping port. Tippecanoe Lake, the deepest lake in the state, reaches depths at nearly 120 feet (37 m), while Lake Wawasee is the largest natural lake in Indiana. At 10,750 acres (summer pool level), Lake Monroe Reservoir is the largest lake in Indiana.